BMW showcased their manufacturing prowess with the C650 Sport, their luxurious scooter. Even though the BMW C650 Sport couldn’t match the sales of the German manufacturer’s S1000RR, they decided to give the scooter a makeover. 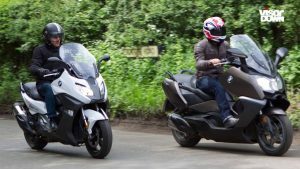 Will the changes made by BMW be enough to boost the sales of their scooter? Let’s see how they fare against our expectations! The most noticeable thing about the BMW C650 Sport is the change in its design. The Germans made significant revisions to its bodywork so that it looks like a sports scooter. As the BMW C650 Sport is mainly for riding around the city, you get upside down forks for the front suspension and monoshock for the rear. Thanks to the fine-tuning by the Germans, the BMW C650 Sport is one of the most comfortable scooters to ride on the road. The suspension is more than capable of handling all the bumps on the road. Even if the road conditions are poor, the scooter will always be in control because of its updated suspension. Even though the scooter has a wet weight of 261 kg, you won’t find it difficult to navigate through the traffic. Coupled with the comfortable, plush, and long seat, you will love riding it through the streets of London. The seat is incredible for the rider as it supports your lower back. On the BMW C650, you 2-piston, twin discs floating callipers in the front brakes and a single disc brake in the rear. Along with its trusty traction control, you will always find the stopping power to be adequate. The screen on the BMW C650 can be adjusted manually by loosening the screws. At its highest position, you should get sufficient protection from the wind. You also get Side View Assist on the BMW C650. When vehicles come close to your scooter, you will see the warning lights on the side mirrors go off. The dashboard on the BMW C650 Sport is readable, crisp and displays important information. You can also toggle the settings with the help of a button. You get plenty of space to store your equipment, thanks to the glove compartment and under-seat storage. The BMW C650 Sport comes with an 8-valve, liquid-cooled, twin-cylinder, 647 cc engine that produces 60 hp of power at 7,750 rpm and torque of 46.46 lb-ft at 6,000 rpm. The power delivery is sufficient and smooth enough for city riding. Along with its 55 mpg and 15.5-litre tank, the petrol station is the last thing you will ever have to visit. The BMW C650 Sport is a great scooter for the city because of its reliability and comfort. Whether you take it to a nearby store or for work every day, the scooter is always up for the job. Handling is also a breeze because the scooter feels nimble and light. The suspension is on point as it can absorb all the imperfections on the road. 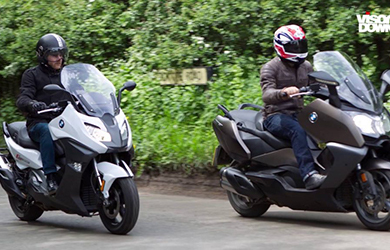 If you wish to be an owner of the luxurious BMW C650 Sport, then you have to pay anywhere between £9,600 to £10,375.